The Medical Campus offers a six-semester, two-year, Associate in Science degree Diagnostic Medical Sonography Program. Attendance is full-time, during the day, and the program averages up to 35 hours per week. Diagnostic Medical Sonography students learn to obtain diagnostic images; analyze technical information relevant to the scan; and evaluate sonograms for image quality and anatomical abnormalities. Students will spend approximately 1,920 hours in supervised clinical rotations. 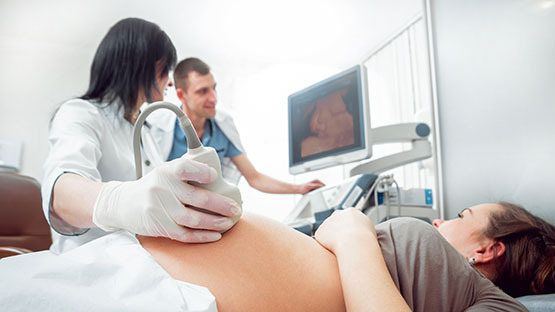 A series of general education and natural science courses are associated with the Diagnostic Medical Sonography program at Miami Dade College. Students interested in this program are required to complete these general education and natural science courses prior to applying and enrolling in the program. Completion of these courses does not guarantee admission to the program. The program provides learning experiences that enable the student to acquire and assimilate the necessary technical competencies to function effectively as a supportive health care provider in the Diagnostic Medical Sonography profession. Graduates of the program are eligible for the following credentialing examination processes administered by the American Registry of Diagnostic Medical Sonography: Obstetrics and Gynecology, Abdomen, and Adult Echocardiography. The Diagnostic Medical Sonography Program is highly demanding, therefore it is recommended students work less than twenty hours per week. Students should also consider family responsibilities before committing to a full-time rigorous program. Students can sit for certification exams in their last semester prior to graduation. Many of the hospitals and clinics in Dade County employ our students. The students will be in the same cohort for two years which leads to a classroom setting that is warm, welcoming, and nurturing. Many of the students form long lasting friendships while in program.